Did you know that highly-aligned organizations achieved an average of 32% year-over-year revenue growth - while their less aligned competitors saw a 7% decrease in revenue? (Source: Sales Enablement: Fulfilling the Last Frontier of Marketing-Sales Alignment, Aberdeen Group, September 2013). With stats like that, who wouldn’t want to create sales and marketing alignment? You may be thinking that sounds well and good but HOW? How do you create that alignment? I recently attended a networking event in Boston. While there, I had the pleasure of speaking with a gentleman that started a SaaS company a little more than two years ago. In talking with him, I asked him a few questions to learn more about his business. One of the things this entrepreneur shared with me is the struggle between his sales and marketing teams. They are currently dealing with the age-old problem… marketing thinks they are generating leads and sales is not doing a good job of closing them, while the sales team is frustrated with the quality of leads that marketing is providing. His sales and marketing teams lack alignment. I share this story because it demonstrates a common struggle…one that I have heard about many times. The real issue here, as it is with many B2B companies implementing an inbound marketing approach, is not that the leads lack quality. The leads lack timing and some qualification. Addressing this issue is where sales development can play an integral part in sales and marketing alignment. According to RingDNA, a Sales Development Representative (SDR) is a type of inside sales rep that focuses solely on outbound prospecting. Many companies (such as Salesforce) have experienced massive revenue growth by separating sales organizations into specific roles. Specifically, unlike quota-carrying salespeople, SDRs don’t focus on closing business. Rather, they focus on moving leads through the pipeline. In many organizations, marketing supplies the SDRs with lead lists. They then email and call prospects in order to further qualify those leads and determine which ones will be passed on to the quota-carrying sales rep. This enables closers to spend more time selling to qualified leads and unburdens sales executives from having to engage in prospecting. If you’re like many small to mid-size businesses, chances are your marketing team is passing leads directly on to the sales team. But what if, you added a sales development function and the marketing team handed the leads to them instead? The SDRs, through various outbound efforts, will connect with the prospects to learn more about their reasons for visiting the website and downloading your content. This conversation is what I'd like to refer to as the "discovery conversation." The SDR will learn more about the prospect to determine if the prospect is qualified enough for the account executive or sales team to put time and effort into talking with them. Not all inbound leads will enter into the sales team’s pipeline. This qualification process is designed to eliminate those that don't fit your ideal client profile or buyer personas. Instead of unqualified leads that don’t fit being passed on to the sales team, only those leads that do fit will stay in the pipeline. Are they now sales ready leads? Let's be clear here. If the timing is not right for the prospect, the SDR will keep ownership of the prospect and continue to nurture them through various touch-points until the timing is right. These are what we call marketing qualified leads (MQL). These leads fit the profile but the timing just isn't right. 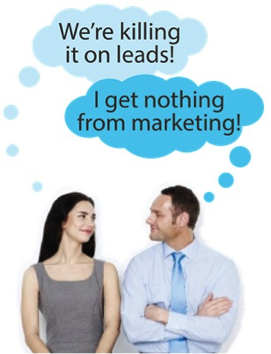 There could also be other reasons that they are not sales ready leads. Since they have the potential to become a sales qualified lead (SQL), the SDR will continue to nurture the MQL until it's ready to become an SQL. Your leads can be eliminated at any step of the process. The SDR will spend the time required to learn more about the prospect to determine if it is worthy of the sales team’s time. Now that you see the natural progression of the leads, whether you're a sales or marketing professional, are you wondering why we didn't identify this sooner? Well 15 years ago, I was the VP of Sales and Marketing for an IT Consulting Firm. I seriously spent 30-40% of my time in meetings defending marketing to sales and vice-versa. Back then, we didn't have landing pages like we do today but we did have "contact us" forms on our website. Marketing was focused on getting leads to visit the website and fill out the contact us form. If this happened, marketing was celebrating the win while sales was complaining they had to call a "tire-kicker". So I hired a Sales and Marketing Coordinator that would call these incoming leads in an effort to qualify them but the conversations were inconsistent and not very efficient. I didn't know if I was training her as a marketing person or a sales person. Today I know what I was doing wrong... she was neither sales nor marketing, she was an SDR... I just didn't know it yet!